The water supply in areas of the North Platte River Basin in the Nebraska Panhandle has been designated as fully appropriated or overappropriated by the Nebraska Department of Natural Resources (NDNR). Enacted legislation (Legislative Bill 962) requires the North Platte Natural Resources District (NPNRD) and the NDNR to develop an Integrated Management Plan (IMP) to balance groundwater and surface-water supply and demand in the NPNRD. A clear understanding of the groundwater and surface-water systems is critical for the development of a successful IMP. The primary source of groundwater recharge in parts of the NPNRD is from irrigation canal leakage. Because canal leakage constitutes a large part of the hydrologic budget, spatially distributing canal leakage to the groundwater system is important to any management strategy. Surface geophysical data collected along selected reaches of irrigation canals has allowed for the spatial distribution of leakage on a relative basis; however, the actual magnitude of leakage remains poorly defined. To address this need, the U.S. Geological Survey, in cooperation with the NPNRD, established streamflow-gaging stations at upstream and downstream ends from two selected canal reaches to allow a mass-balance approach to be used to calculate daily leakage rates. Water-level and sediment temperature data were collected and simulated at three temperature monitoring sites to allow the use of heat as a tracer to estimate the hydraulic conductivity of canal bed sediment. Canal-leakage rates were estimated by applying Darcy's Law to modeled vertical hydraulic conductivity and either the estimated or measured hydraulic gradient. This approach will improve the understanding of the spatial and temporal variability of canal leakage in varying geologic settings identified in capacitively coupled resistivity surveys. The high-leakage potential study reach of the Tri-State Canal had two streamflow-gaging stations and two temperature monitoring sites along its length. Calculated leakage rates from the mass-balance approach varied from year to year and were generally dependent on local climatic conditions, and the timing and magnitude of the initial seasonal diversion into the Tri-State Canal. Leakage rates ranged from 0.98 meter per day (m/d) on June 22, 2007, to about to 0 m/d during July 2009. Drier conditions generally resulted in higher leakage rates because of reduced flow from Spottedtail Creek, lower groundwater levels near Spottedtail Creek, and no unmeasured flow entering the reach. Of the three years studied (2007–09), 2007 was the driest, and therefore had the highest canal leakage rates. The moderately low leakage potential study reach of Interstate Canal had two streamflow-gaging stations and one temperature monitoring site along its length. Excluding the leakage calculations from early May 2007, leakage rates ranged from 0.08 to 0.7 m/d. Less variability in leakage from year to year indicates that climatic conditions may have less of an effect for Interstate Canal compared to Tri-State Canal. This may be because Interstate Canal was cut into the northern edge of the North Platte alluvial valley and consequently the canal bed is well above the local groundwater table resulting in a constant (1 meter per meter [m/m]) hydraulic gradient. Interstate Canal also does not receive any captured flow that can vary substantially year to year. Two temperature monitoring sites were installed within the high-leakage potential reach of Tri-State Canal. Site TCTEMP1 was established in 2007 where the water table was well below the canal bed surface. The vertical hydraulic conductivity of the poorly sorted sand and gravel beneath site TCTEMP1 was estimated using a calibrated one-dimensional VS2DH model. Using a trial-and-error approach, the best-fit vertical hydraulic conductivity for the site TCTEMP1 model domain was 1.1 m/d. Site TCTEMP2 was established at the mouth of Spottedtail Creek where a shallow water table may restrict canal leakage. The mean vertical hydraulic conductivity estimated from the best-fit VS2DH model was 1.5 m/d; however, measured hydraulic gradients ranged from -0.14 to -0.07 m/m, resulting in canal leakage rates that ranged from 0.1 to 0.2 m/d. Because hydraulic gradient only was collected at one point, it was not possible to spatially extrapolate this estimate to other parts of the high-leakage potential reach. Site ICTEMP is a temperature monitoring site that was established in 2008 to estimate the hydraulic conductivity of near-surface sediments, and to understand canal leakage and recharge mechanisms in a fractured Brule setting. Based on the thicknesses and modeled vertical hydraulic conductivities, an average vertical hydraulic conductivity of 0.74 m/d was computed. The vertical hydraulic conductivity of the least permeable layer had the greatest effect on the mean vertical hydraulic conductivity, and therefore, canal leakage. The hydraulic gradient is assumed to be 1 m/m because the bed of the canal is well above the water table along the study reach; therefore, the canal-leakage rate at site ICTEMP is estimated to be 0.74 m/d. 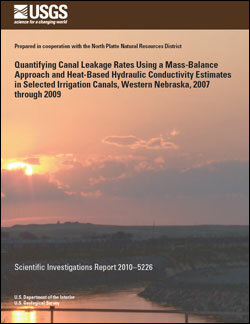 Hobza, C.M., and Andersen, M.J., 2010, Quantifying canal leakage rates using a mass-balance approach and heat-based hydraulic conductivity estimates in selected irrigation canals, western Nebraska, 2007 through 2009: U.S. Geological Survey Scientific Investigations Report 2010–5226, 45 p.